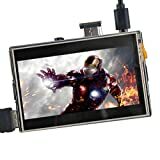 3.5" TFT monitor has sensitive and stable touch function. It is an ideal alternative solution for monitor. Clear Case is designed for OSOYOO 3.5" LCD screen on Raspberry Pi 2/3. It is convenience to carry your Raspberry Pi2/3 and LCD screen together. Updated case with screw design which is much stronger, it is not easily damaged.